Here’s an idea. Instead of Christian missionaries heading off to third world countries to evangelize the lost, why not remain at home and evangelize college students. 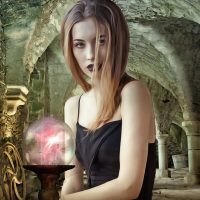 As it turns out, many institutions of higher learning promote paganism; thus, a large number of college educated millennials have bought into pagan beliefs, hook line and sinker. They’re involved in occult practices like astrology, tarot card reading, aura reading, palmistry, Runes, charms, potions, they play the Ouija board game and so on and so forth. In other words, college students are practicing the magik arts, what is commonly called witchcraft. Sure, Christians must share the gospel of Jesus Christ with people in developing countries; but according to Joseph Torres, the good news must be shared with millennials in their own home towns as well because universities are churning out witches faster than you can say Hogwarts. “College campuses in particular are fertile breeding grounds for open occultism among millennials,” writes Torres. He warns that witchcraft has become the norm. The more things change, the more they stay the same. With each passing generation, this cliché takes on deeper levels of truth. Many have noted just how different the so-called millennial generation (the 18-30 demographic) is from the generations that came before them: their lack of respect for authority, their obsession with entertainment, and their penchant for social media. Yet, for all these differences (and many of them are greatly exaggerated), one thing has remained consistent. The millennial generation is as much under the spiritual attack of paganism as every generation reaching as far back as the Garden of Eden. Now, I can imagine that some may read those last few sentences with a jaundiced eye. Maybe I’m simply being a Pollyanna, a conservative alarmist warning the masses that the bad people are “coming for your children.” The fact is I’m also skeptical of fanciful claims with a conspiratorial bend. But it appears paganism, and by this I mean “out-and-proud” occultism is making a comeback among young people, and is backed with all the promotional punch of the Internet, social media, and Youtube. monistic and pantheistic beliefs that all living things are of equal value. … Humans have no special place, nor are they made in God’s image. … Wiccans believe that they possess divine power within themselves and that they are gods and goddesses. …Consciousness can and should be altered through rite and ritual.